Home BuzzIn And we celebrate 1st April as NO FOOL’s Day! When Houston coined this, she mustn’t have thought of a world where most people and most brands would make a choice to compromise and fool themselves just because it’d earn them a few extra bucks. Are you not fooled into believing false claims and promises all year round? Aren’t you made to pay ‘a little extra’ for most of the products and services – both online and offline because you’re made to believe that what you’re looking at is the most lucrative offer, which later end up as deceitful? Don’t you encounter fake, bloated offers and schemes, the reality of which lies behind that little asterisk hanging in the corner of the offer? Well, we know you answered most of these (or all) with a ‘Yes’. Means every day of the year is an April Fools’ Day for you (being taken astray) as well as for these brands (making gains by fooling innocent customers). The harsh reality is, that it is! You should believe a brand that is honest in its efforts and which brings you the best of services at prices which fit your pocket. Our true mission is to make your journeys more complete and better in every possible way. And to achieve that, if we are required to tread the extra mile or beat the business norms, we’re ever ready! When we launch a service, we want to address a travel problem faced by our users. Similarly, when we launch an offer, we want to give you a cost effective way of ordering and using our services. We believe that you are our strength, the force that keeps us going. Hence, we can’t even think of tricking you for any temporary gain. For us, seeing a smile of contentment on your face is much more precious than earning a little extra. We’d rather give you a ‘little extra’ if that makes you any happier. 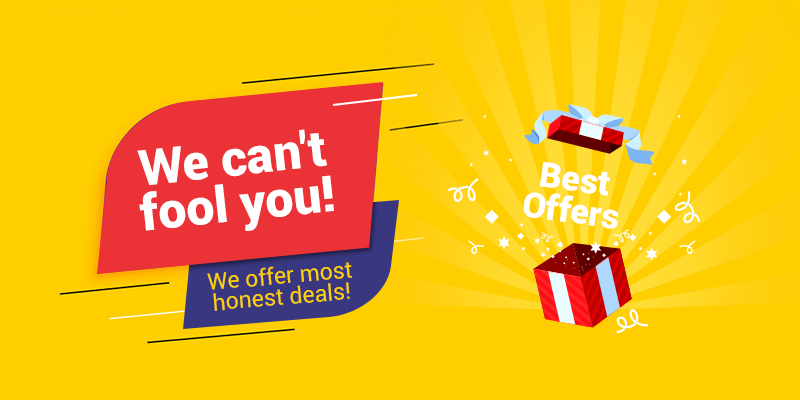 How are our offers different from the rest? We just told you, our offers are just a token of appreciation and gratitude and nothing else. Whether you book bus seats, hotel rooms, outstation cabs or order food on train; we understand that you are resting your trust in us, in reciprocation, we want to reward you with various discounts and offers, which other brands seldom do. 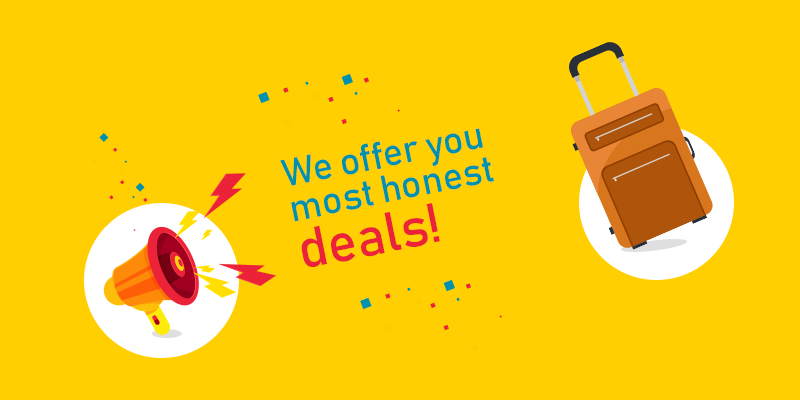 Fair & Honest Deals: While most brands are after earning huge margins, we believe in making your journeys better. So, each and every offer we come up with is an honest effort to attain that goal. We put up the offer on our app and website, and allow all our users to access the offer equally. Not only this, unlike other brands we do not want to promote a lackluster service through our offers. Rather, our offers are available for the best services only! Transparent Policies: How many times have you seen an offer, used the service and found yourself duped at the end of it? Many a times, we believe! But RailYatri delivers exactly what we show. Of course each of the offers come with certain Terms & Conditions, which you can easily go through before applying. But, if you meet the criteria, pre-set by us, than we would keep our promise and give you the benefit. RailYatri will not charge any hidden costs or come up with some dubious sub-clause depriving you of the offer benefit. 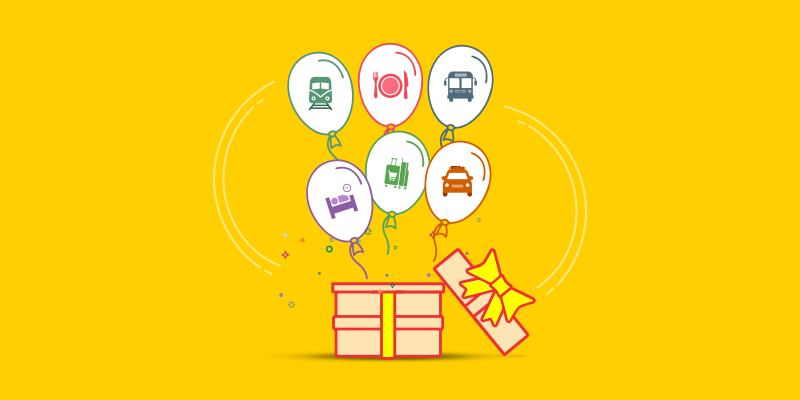 Easy to Find and Apply: As mentioned before, all our offers are showcased within the RailYatri app as well as the website. Apart from this, we keep our users informed about these attractive deals through in-app Notifications and Facebook posts. So, all our offers are easy to find. And once you find them, we have made sure that the offers are easy to apply. Only a click is needed to grab an offer you like. This April Fool’s Day, we would request you to stay smart and choose brands that are truly honest in their intentions. RailYatri is and will always remain your well-wisher and most honest travel companion. Previous articleFood in Nagpur: RailYatris just love it! Next articleWe have de-listed restaurants for failing to meet your expectations!